Rich in vitamin C, manganese and copper, pomegranates are a powerhouse of nutrition. People worldwide use them in both sweet and savory dishes, juices, smoothies and snacks. Dried pomegranate seeds are a popular ingredient in trail mixes, grenadine syrup, sauces, granola bars and salad dressings. This delicious, juicy fruit can keep your bones healthy, reduce inflammation and boost your performance in the gym. Pomegranate seeds are loaded with vitamins, minerals and phytochemicals. Ellagic acid, one of the most abundant antioxidants in this fruit, may improve metabolic health and prevent obesity, according to a 2016 research paper published in Advances in Nutrition. This natural compound fights inflammation and reduces the expansion of white adipose tissue, making weight loss easier. A single pomegranate boasts nearly half the daily recommended vitamin C intake and large amounts of vitamin K, folate, thiamin, potassium, copper, manganese, selenium and other essential nutrients. The pomegranate arils, which enclose the seeds, are edible too, and can be used in a multitude of recipes. Both the arils and seeds make a healthy snack between meals and are a wonderful addition to oatmeal, yogurt, salads, freshly squeezed fruit juices and baked goods. This delicious fruit and its juice are chock-full of antioxidants. According to a 2014 review in Advanced Biomedical Research, pomegranate juice has higher antioxidant levels than green tea and red wine. When consumed regularly, it may inhibit tumor growth and lower your risk of colon, breast, prostate, lung and skin cancers. Due to its anti-inflammatory and antihypertensive properties, it supports cardiovascular health and may protect against heart disease. Pomegranate juice contains both the seeds and arils. Therefore, whether you eat pomegranate seeds or drink the juice, you'll get a hefty dose of vitamins and antioxidants. The peel is healthy too; simply let it dry in the sun and then roast it or grind it into powder and add it to your daily meals. A 2015 study featured in the journal Nutrients found that pomegranate peel extract supports bone health and may prevent bone loss in mice; more research is needed in this area, but scientists believe that pomegranate may play a role in osteoporosis prevention. If you have a hard time recovering from exercise, look no further. Pomegranate extract increases blood flow to the muscles and tissues, delays fatigue and speeds up post-workout recovery. These effects are largely due to the polyphenols in pomegranate seeds and arils. To reap the benefits, drink a glass of pomegranate juice or eat a handful of seeds about 30 minutes before training. More than 103 million U.S. adults have high blood pressure, according to the American Heart Association. The number of deaths associated with this condition increased by a staggering 38 percent between 2005 and 2015. If your blood pressure is above normal, you're at a higher risk for stroke, heart disease, cardiac arrest and other cardiovascular events. Pomegranate seeds are not a miracle cure and cannot replace medications, but can make it easier to keep your blood pressure low. A 2018 review published in Frontiers in Pharmacology assessed the vasculoprotective effects of this fruit. Researchers have found that pomegranate may improve endothelial cell function, reduce platelet aggregation and neutralize free radicals, leading to better cardiovascular health. The antioxidants and phytochemicals in this food may help protect against hypertension and its complications. Rich in ellagic acid, gallic acid, lignans, polyphenols and other bioactive compounds, pomegranate has been shown to lower blood pressure and enhance vascular function. Furthermore, it can offset some of the negative effects of medications and chemicals. These compounds occur naturally in its peel, seeds, leaf and juice. The seeds are high in p-coumaric acid, plant sterols, tannins and fatty acids. In addition to their antihypertensive effects, they may help reduce blood sugar levels. The beneficial compounds in pomegranate may lower your risk of developing cancer, according to a 2015 research paper in Oxidative Medicine and Cellular Longevity. This fruit is rich in polyphenols, a class of antioxidants that help reduce oxidative stress, DNA damage and inflammation. At the same time, they may inhibit tumor growth and induce apoptosis (cancer cell death). In the clinical trials cited in the research, pomegranate and its components have been found to protect against colorectal cancer, hepatic cancer, breast cancer and leukemia, among other life-threatening diseases. A more recent review published in the journal Molecules in 2017, suggests that the pomegranate fruit regulates multiple signaling pathways and may prevent cancer cells from spreading throughout the body. It also reduces the harmful impact of UVA- and UVB-induced damage, which in turn, may help prevent skin cancer. Pomegranate benefits go beyond supporting a healthier heart and preventing cancer. This antioxidant-rich fruit protects your brain from oxidative stress, according to a 2017 study in the BMC Complementary and Alternative Medicine. Its juice has been shown to reduce fetal brain injury, due to its anti-inflammatory and neuroprotective effects. Furthermore, this fruit may lower your risk of Alzheimer's disease and stimulate the formation of new neurons in the brain. 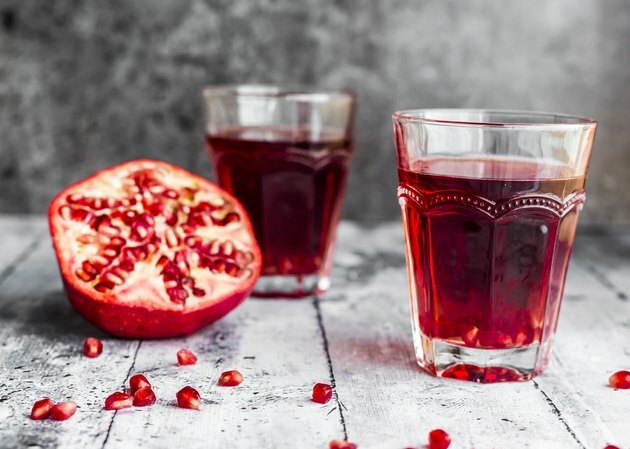 Simple dietary changes, such as drinking a glass of pomegranate juice daily or sprinkling pomegranate seeds over your meals, could keep your brain sharp until late in life. Loaded with vitamin C and antioxidants, this fruit can enhance your beauty routine and slow down aging. According to a 2016 study featured in the journal Nature Medicine, ellagitannins — a class of antioxidants in pomegranate — are turned to urolithins in the gut. These molecules exhibit anti-inflammatory, antioxidant, antimicrobial and anticancer properties. Urolithin A appears to be particularly beneficial. As Nature Medicine points out, this compound may improve mitochondrial and muscle function, leading to a longer life. Pomegranate seeds are also rich in vitamin C, a nutrient that supports collagen synthesis and fights free radical damage. After all, there's a reason why most anti-aging creams and lotions have vitamin C listed on the label. This water-soluble vitamin protects your skin from oxidative stress and UV-damage, promotes skin repair and reduces transepidermal water loss. In the long run, it can minimize the appearance of wrinkles and improve skin appearance. What Are the Benefits of Cactus Fruit?